Late last year I was invited to contribute to an exhibition called FAIL BETTER at The Science Gallery in Trinity College Dublin. That exhibition is on for the next 3 months and has been billed as a perspective-shifting exploration of epic and inspirational failures. It features contributions from all walks of life, including famous explorers, inventors, scientists, and athletes. Our contribution was to bring Christopher Reeve’s wheelchair to Ireland to highlight the failed notion of rehabilitation; that the wheelchair compensates for our inability to walk. In preparation for the South Pole Race, I learnt a lot about Shackleton, Scott and Amundsen, the polar explorers who carved those first trails into the Antarctic ice. They were the pioneers – that was their privilege, their courage, their risk. They charted the unknown world showing the way for the rest of us. 100 years on I followed in their tracks as I became the first blind person to race to the South Pole. 18 months after the race a fall from a second story window nearly killed me. I broke my back and the damage to my spinal cord left me paralysed. Now I am inspired by the vision of another explorer – Christopher Reeve. I am travelling in his tracks. He dreamed of empty wheelchairs. He and his wife Dana were the hub around which new global collaborations formed with the aim of curing paralysis and they forged ahead with intelligence and ambition. Sadly Christopher died in 2004 from complications related to his paralysis before their ambition was realised; Dana died almost two years later from cancer. But the legacy they left us is strong. 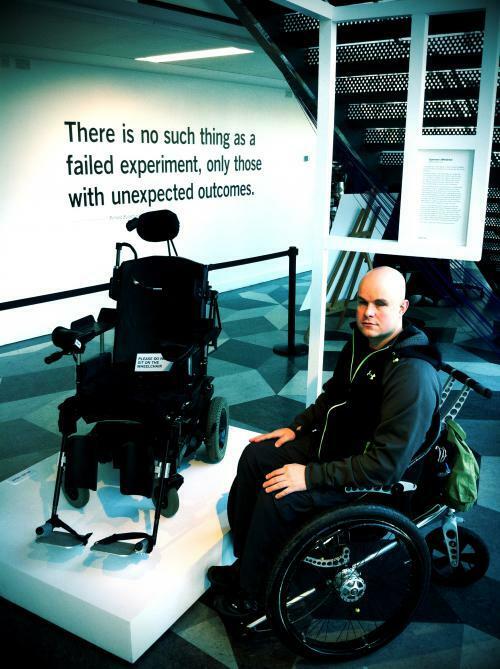 In a world that has failed to discover the cure for spinal cord injury Christopher has shown me the way. He explored his own body, exercising his atrophied muscles with functional electrical stimulation, doing what he could to weight bear, to stand and to walk his paralysed limbs. So now I roll to the gym every day in my wheelchair to explore the possibility of spinal cord injury recovery using aggressive physical therapy and high-dose electrical stimulation. I strap my paralysed limbs into my Ekso Bionics robotic legs and I walk. I walk miles and miles of uncharted steps towards the frontier of recovery. I believe a cure for spinal cord injury is possible. Success is our objective. And we know that in our pursuit of a wildly ambitious goal, the potential for failure travels with us. If there is no risk of failure, it’s probably not worth pursuing.